In the ponderosa pine forests and deserts of northern Arizona, the Colorado River undulates for 277 miles through the red-banded rocks of the Grand Canyon. Millions of people visit the canyon each year, but few know about the region’s other geologic rarity: uranium-rich columns of rubble. 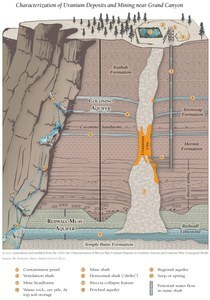 Some 200 million years before the Grand Canyon existed, subterranean water hollowed out pockets in the Colorado Plateau. Over time, the rock layers above collapsed into these empty spaces, creating underground shafts, called breccia, or “broken,” pipes, approximately 300 feet in diameter and up to 1,000 feet deep. Their rubble pulled uranium from groundwater — meaning that the pipes hold some of the nation’s richest and most accessible uranium deposits. A breccia-pipe uranium deposit, and how it's mined in the Grand Canyon region. 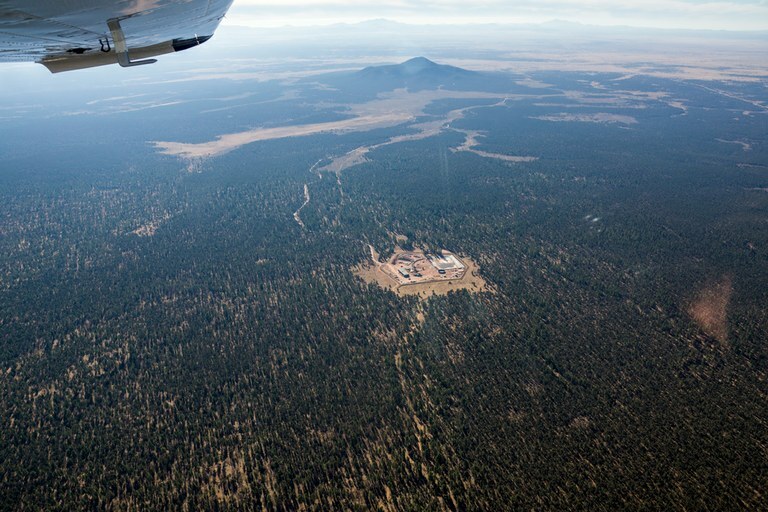 Since 2012, a moratorium has blocked any new effort to mine this uranium near the Grand Canyon. Now, the Trump administration and some Western members of Congress are pushing to lift that moratorium. This worries federal scientists, who have made slow progress toward understanding the dangers that uranium mining poses to the region’s water and wildlife, and it frustrates local communities, who have long opposed mining here. Between 1956 and 2009, mining companies pulled 23.3 million pounds of uranium from the Grand Canyon region, creating a legacy of polluted water, contaminated soil and toxic mine sites. More than 800 active claims already dot the landscape that the moratorium covers, and many more could. Not all breccia pipes hold uranium, but the USGS estimates that 205 million pounds of the heavy metal remain to be claimed in the moratorium area. The Kanab North breccia-pipe uranium mine — now in reclamation — sits just above Kanab Creek in northern Arizona. The moratorium resulted from a mid-2000s uranium rush, when companies staked thousands of claims on the Colorado Plateau. In response, then-Secretary of the Interior Ken Salazar froze new uranium mining claims on approximately 1 million acres of land for two years, while researchers investigated possible dangers. In 2012, citing concerns about the “natural, cultural and social resources” in the park and beyond, Salazar established a 20-year moratorium. Mining companies and Republicans pushed back. In 2012, the National Mining Association and others sued unsuccessfully to overturn the ban on new mining claims. Arizona Rep. Paul Gosar, R, who coauthored legislation in 2011 to prevent the moratorium, is also championing the current efforts to lift it. In May, he led Republican members of the Congressional Western Caucus in penning a letter requesting the moratorium’s end, calling restrictions on minerals such as uranium dangerous for national security. Gosar did not respond by press time to requests for comment. Now, the Trump administration is moving to make mining uranium easier. In an executive order last year, President Donald Trump exhorted agencies to review all federal regulations that might lessen or delay domestic energy production, including nuclear energy. The administration has also expressed interest in developing more nuclear weapons, to add to the country’s current stockpile of an estimated 4,000 nuclear warheads. In May, the administration listed uranium as a critical mineral, even though only nonfuel minerals may be listed. The next week, Nevada Rep. Mark Amodei, R, added a rider to the 2019 defense spending bill that would weaken the environmental review process for critical minerals extraction. 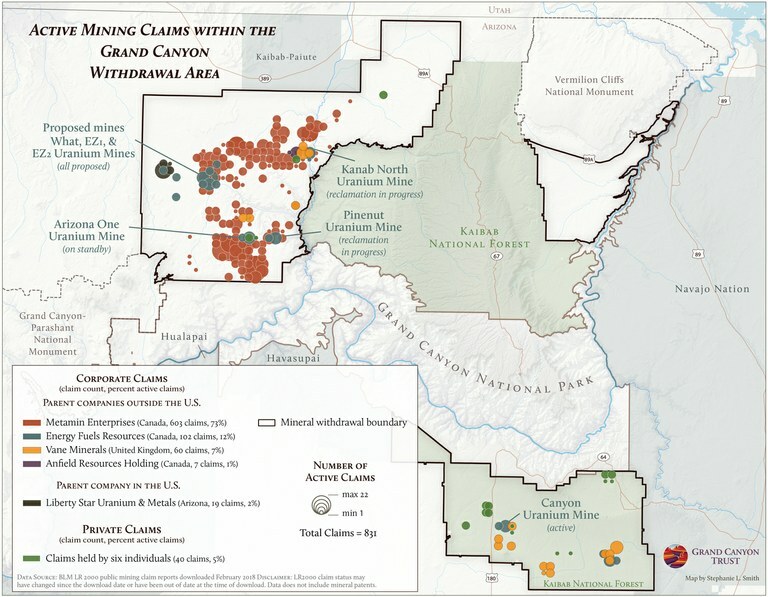 The 2012 moratorium did not affect existing mining claims in the Grand Canyon withdrawal area, and 11 uranium mines still could be developed there, even with the moratorium in place. For several years, uranium prices have been too meager for mining to be profitable. In January, mining company Energy Fuels Resources, whose parent company is Canadian, and others petitioned the administration to impose a quota on uranium imports and require utilities and agencies to purchase uranium from domestic sources. And they continue pushing for more mines. Speaking before the House Committee on Natural Resources last December, Katie Sweeney, senior vice president and general counsel for the National Mining Association, said, “The scientific, technological and socioeconomic facts have not supported the need” for the million-acre withdrawal. More than a decade ago, as Salazar considered creating the moratorium, he tasked a team of USGS scientists, including Tillman, with providing information on uranium mining’s risks to the region. It quickly became apparent that important information was missing: how uranium mining affected wildlife, whether regional aquifers — and the Colorado River — might become contaminated, and whether local water supplies would vanish. The moratorium gave researchers time to tackle these questions, though funding for the studies had to be approved by Congress each year. The research has been underfunded, leading to large gaps in knowledge. “From the scientific perspective, there’s just so much we don’t know,” Tillman said. If an accident occurred at Canyon Mine, on 17 acres of barren red dirt in deep green forest, nobody knows whether that contaminated water would flow toward the Grand Canyon and the tribes that rely on local water sources, or harm the town of Tusayan, six miles away. And the Redwall-Muav aquifer, below the Grand Canyon, is one of the state’s largest. It connects to the Colorado River, and if mining contamination reached it, that could affect the water supply of some 30 million people, according to the nonprofit American Rivers. Scientists also have very little data on uranium mining’s threats to wildlife. Uranium dissolves quickly in water, so mines create fenced-off drainage ponds to store contaminated groundwater and runoff. In the region’s high desert, those ponds attract thirsty wildlife. “You can imagine, any bird, critter, anything that can get into there, wants to get into that pond,” Tillman said. And piles of waste rock attract animals burrowing out of the heat. There is also potential for uranium-tainted dust to blow offsite, creating windborne “blooms of radiation,” which have been detected near North Rim mines. But scientists haven’t yet traced the wider effects of that exposure on wildlife or humans. If the moratorium were lifted, funding for that work could disappear, too. Regional tribes, including the Havasupai, Navajo, Hualapai and Kaibab-Paiute, have long opposed the uranium mining. Last October, the National Congress of American Indians passed a resolution against ending the moratorium. 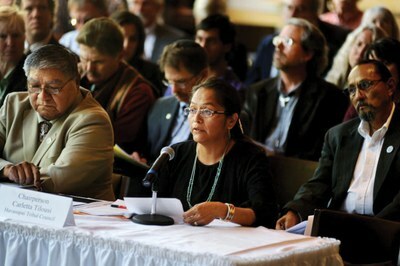 Havasupai council member Carletta Tilousi testifies in favor of permanently banning uranium mining in Grand Canyon watersheds. Tribal opposition stems partly from the industry’s history in Indian Country. On the Navajo Nation, more than 500 abandoned uranium mines await remediation, and research has found increased cancer rates among Navajos who worked in mines or live near contaminated sites. In Laguna Pueblo in New Mexico and elsewhere, residents live beside tailings piles. Religiously significant places are threatened, too. As a child, Tilousi watched elders fight the construction of Canyon Mine near Red Butte, a hill of red rock rising from the surrounding mesa. Havasupai oral tradition describes the butte and surrounding land as the umbilical cord of Mother Earth. Though the mine was built in the 1980s, tribal members still travel to Red Butte on pilgrimages. The Canyon Mine stands near Red Butte, a sacred site to the Havasupai. The mining industry says the risks are low. “When people talk about (Canyon Mine) harming the Havasupai, harming the Grand Canyon — (uranium is) being mined today by the river,” Mark Chalmers, the president and CEO of Canada-based Energy Fuels Resources, which owns Canyon Mine, told a group of reporters in February. Uranium does occur naturally in some Grand Canyon springs and streams but tends to be below dangerous levels. Still, the region’s mining past offers a cautionary tale. The Orphan Mine, started in the 1950s, closed more than 40 years ago and has still not been cleaned up. 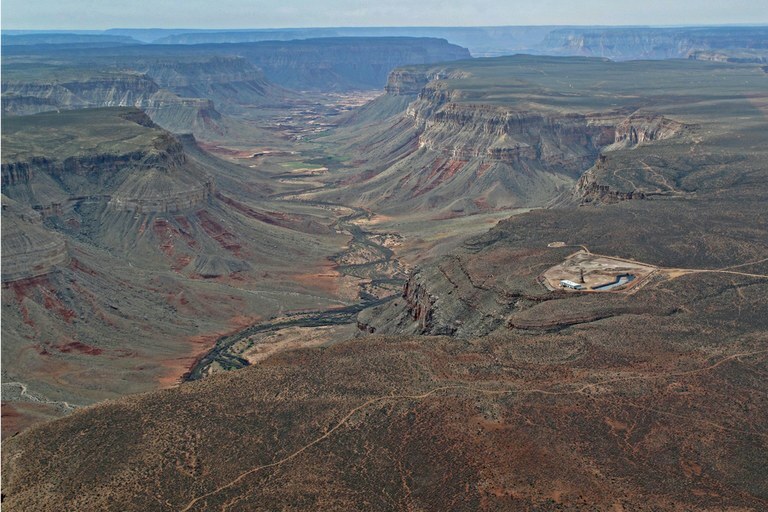 Now located within the boundaries of Grand Canyon National Park, the contaminated area spills over the canyon’s rim and into a lower mining site. Today, visitors to the canyon’s South Rim trail skirt the site, passing a warning not to enter the flattened and denuded area. The mine’s obvious visible infrastructure, including a tram that hauled uranium up from below, has been removed, but its traces will linger on the landscape and in the water for many more decades. This story was made possible in part by support from the Institute for Journalism and Natural Resources.